The Suffolk County SPCA has received a Proclamation from New York State Senator Phil Boyle for their hard work during and in the aftermath of Superstorm Sandy. Lindenhurst, NY - June 7th, 2013 - The Suffolk County SPCA has received a Proclamation from New York State Senator Phil Boyle for their hard work during and in the aftermath of Superstorm Sandy. 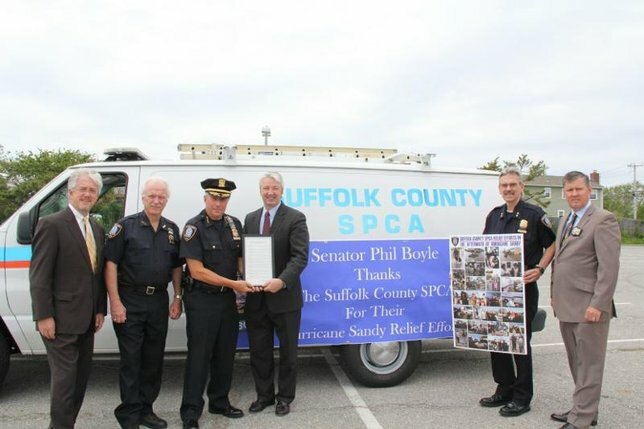 Roy Gross, Chief of the Suffolk County SPCA said that Senator Boyle presented a proclamation to him and other officers of the Suffolk County SPCA on June 6th at Shore Rd. Park in Lindenhurst. During the hurricane, officers and volunteers from the SPCA staffed 3 Pet-Friendly Shelters throughout Suffolk County and provided the services of the agency's MASH Unit. After the storm subsided, Suffolk SPCA volunteers spent months distributing free pet food to victims in storm-ravaged areas of Suffolk County as well as providing free veterinary care and rabies inoculations. Subject: LongIsland.com - Your Name sent you Article details of "Suffolk County SPCA Receives Honor From State Senator"